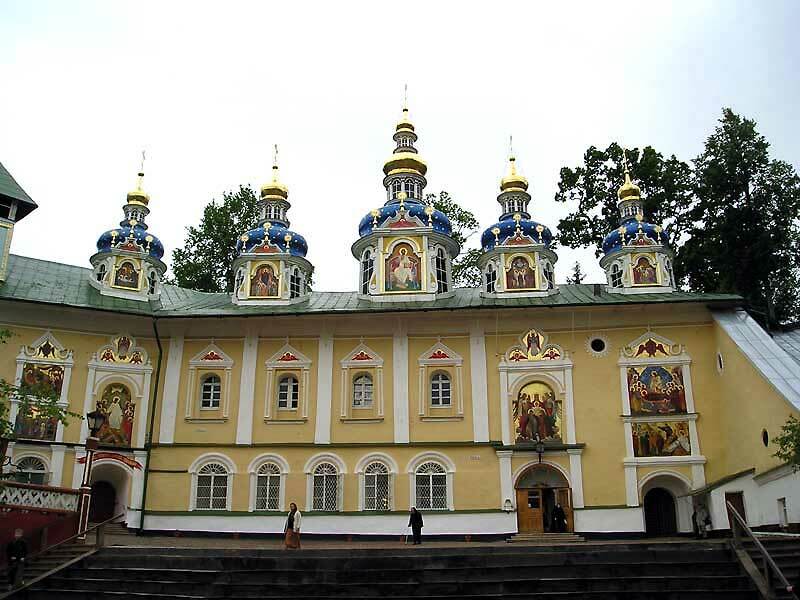 Pskov-Caves Monastery was lit in 1473, when the first cave church - Assumption. Its founders have followed the traditions laid down by the first hermits of the Christian East, who lived in caves. In the land of all looks like a conventional church, houses and farm buildings, surrounded by walls. As a fortress monastery also unique: its center moved to the hem between the hills and ravines to hide the edge of the eye of the enemy. Stone walls were erected at abbot abbot Cornelius in 1558-1565, respectively. Despite the important role of the abbot of the Livonian War, according to "The Tale of Prince Kurbsky" Ivan the Terrible was decapitated monk, but repented of their deeds, lifted the lifeless body and carried it into the center of the monastery. This road has since been called the "Bloody descent," and the name of Cornelius entered in the famous royal "obituary" on a par with other victims of royal wrath. Access to the free wall of the monastery (but do not forget that women are supposed to skirt and shawl - all available at the entrance to the monastery). And city residents are willing to provide their services to place for the night. Pskov - an ancient center of a small but rich and self-seigniorial state - Pskov Veche Republic (1348-1510 gg.) - Was the first great fortress city, which met the enemy on the north-western boundary of Russia. Mr. Pskov was built as a fortification on the direction of the rivers of the Great and Pskov in the VIII-X centuries and was first mentioned in chronicles in 903 year on the occasion of the marriage of Prince Igor's Princess Olga, a native of this place. The heart of the city's fortifications was Crom (Kremlin) on a narrow promontory at the confluence of the rivers. 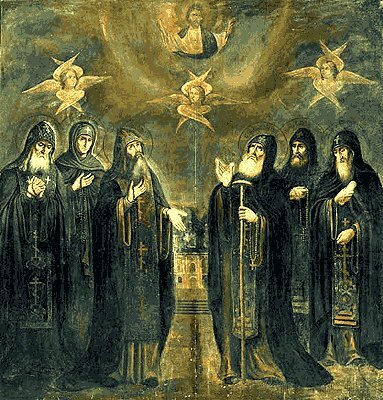 Inside it was a Holy Trinity Cathedral in Pskov with the burial of princes, who served as a symbol of the city (today - built in 1699), there were controls, were stored state archives and the treasury, as well as weapons and stocks of grain, going to council, to judge. By the second half of the XIII century are the earliest remains of a stone wall - Dovmontova city. It was the second line of fortifications established during the reign of the Lithuanian Grand Duke Dovmont, or Timothy. In 1309 Boris burgomaster erected south of the city Dovmontova another wall inside it, "in Zastene" was crowded area - Targovishte. In the years 1374-1375 Posad was surrounded by a stone wall of another (average city). At the time when Moscow supplied only the first of the stone citadel, surrounded himself with Pskov has four belts of stone fortifications. The outer wall, strengthened by battle towers, securely protected porubezhny city from attack. 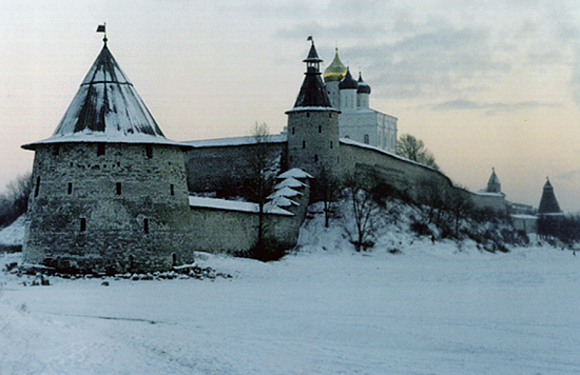 A total of defensive walls of Pskov stretch of 9.5 kilometers. In the years 1581-1582 five-month siege of the city withstood the forces of the Polish king Stefan Batory Foundation, and its defenders repulsed the attack of 31. Pope Anthony Messenger Possevino reported: "The most courageous wives with them, or putting out the fire, or the height of the walls dropping logs and stones at the enemy." From the time of Princess Olga of Pskov women walked around with weapons, but in a sign that the city will stand up to the last, they cut off the spit and set fire to them, and cast from the walls of the enemy. Because near Pskov in the church allowed women clipped. 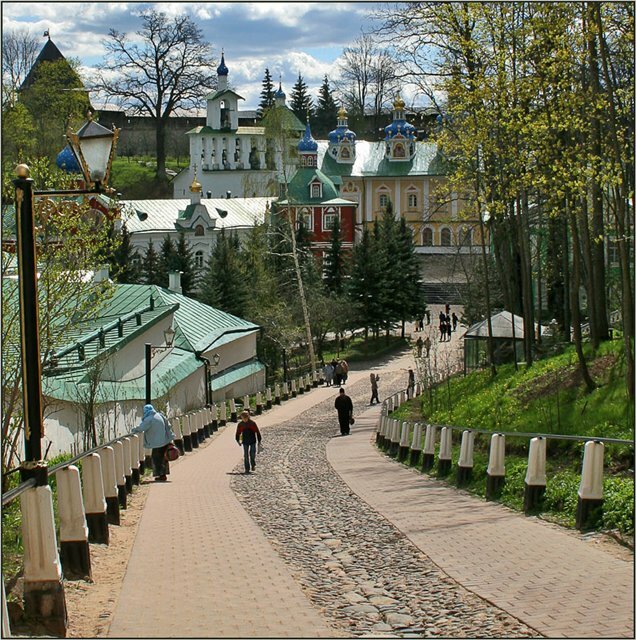 Unlike most cities in Old Russia, Pskov was not only wood but of stone. 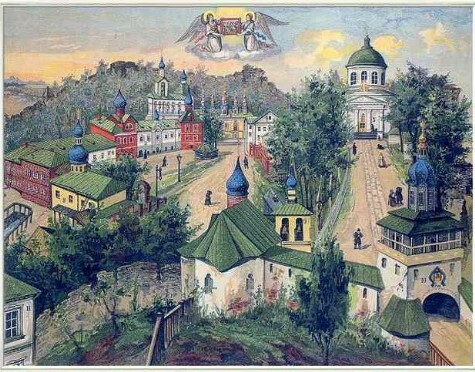 In the XII century, it was erected stone churches (Trinity, Demetrios, churches and the Princess Mirozhsky monasteries). Whitewashed and decorated with modest decor domed church can be seen throughout the city today. 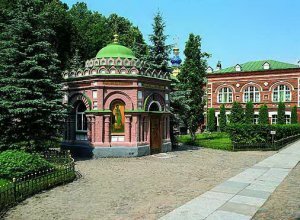 And in the XV-XVII centuries in Pskov has developed a recognized center of the art of building and developed a special architectural style, distinguished by both the simplicity, austerity and plasticity (writ of Commerce, Pogankiny, Podznoevskie Menshikov and Commerce). Along the way, from Pskov to Ivangorod stretches the famous Lake Peipsi along the eastern coast, which stretch beautiful sandy beaches.